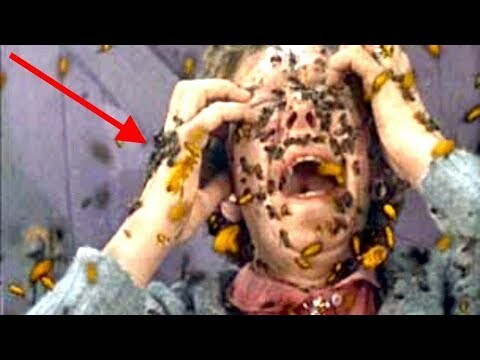 When Bees Attack | We Seek the Truth! When bees attack. These flying insects shouldn’t be disturbed. Let’s take a look at bee hives that turned on humans and stung them multiple times. Bees are flying insects of the Anthophila group, known for their sting and producing honey and beeswax. Bees are adapted to feeding on nectar as well as pollen and play an important role in pollination. This is the transfer of pollen from the male part of the plant to a female part of the plant thus enabling fertilization and the production of seeds. They range in size and length from 0.08 inches, for some stingless bee species, to 1.54 inches for the largest leafcutter bee species. They have large compound eyes and antennae which hold sense organs tasked with detecting smell, taste and air movements. Their bodies have three segments and wings which, in flight, employ the same mechanics as helicopters. There are approximately 20,000 bee species, grouped in various biological families with a worldwide distribution. The western honey bee, or the European bee, is the best-known and can be found on every continent, except Antarctica. Bees can be solitary or live in various communities. True honey bees are highly social creatures and their colonies are established in swarms consisting of a queen, worker bees and male bees, or drones. Each of them has different duties and responsibilities within the colony. Human apiculture or beekeeping has been practiced for thousands of years, since Ancient Greece and Ancient Egypt. A honey bee leaves its barbed stinger inside your skin, and flies away thus tearing off its abdomen. However, the queen honeybee and other bee species are known to have smoother stingers with smaller barbs and may sting vertebrates repeatedly. Luckily, the queen doesn’t usually leave the hive and mainly uses its stinger for dispatching other queens. Wear light colored clothing and don’t disturb bee hives. Cover your head and face and run away until the bees stop chasing you. A cold compress or icepack can be applied to the affected area along with taking aspirin, acetaminophen and Benadryl to help ease the itching. Avoid scratching the area as it will only increase the swelling.